Editor’s Note: This piece ran in the Wednesday, June 13, 2018, Cedar Rapids Gazette as a guest opinion from IPP’s David Osterberg. The attack on higher education funding by the governor and legislative leadership has gone too far for at least one longtime tax-cutter. Former state Sen. Larry McKibben, a member of the Iowa Board of Regents, expressed his concern about state support of universities. 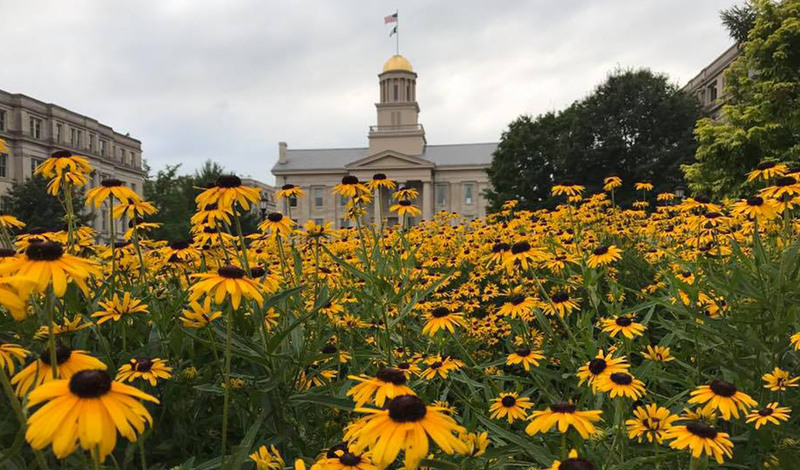 The regents voted Thursday to raise university tuition rates at Iowa, Iowa State and Northern Iowa universities, following $40 million in state funding cuts. In fairness, the groundwork has been laid for this latest attack over many years. An Iowa Fiscal Partnership report in 2012 showed how spending on the UI, ISU and UNI dropped from fiscal year 2000 through fiscal year 2012. An Iowa Policy Project analysis by Brandon Borkovec showed that adjusting for inflation, state funding for Iowa public universities has declined since fiscal year 2001 by 40 percent at UI, 42 percent at ISU, and 28 percent at UNI. As a percentage of university budgets, the state share dropped by almost half from fiscal years 2001 to 2016. Some of this happened on McKibben’s watch as one of the Legislature’s most powerful lawmakers on tax policy — one who often looked for ways to cut taxes, as he did in 2003 with a proposed flat tax that would have cost more than $500 million. He did not intervene to rein in the Research Activities Credit, which sends more than $40 million a year to profitable corporations that pay no income taxes to the state. He turned the other way as corporations raided Iowa’s treasury through tax loopholes at a cost of $60 million to $100 million a year. These same trends were happening when McKibben was a legislator. 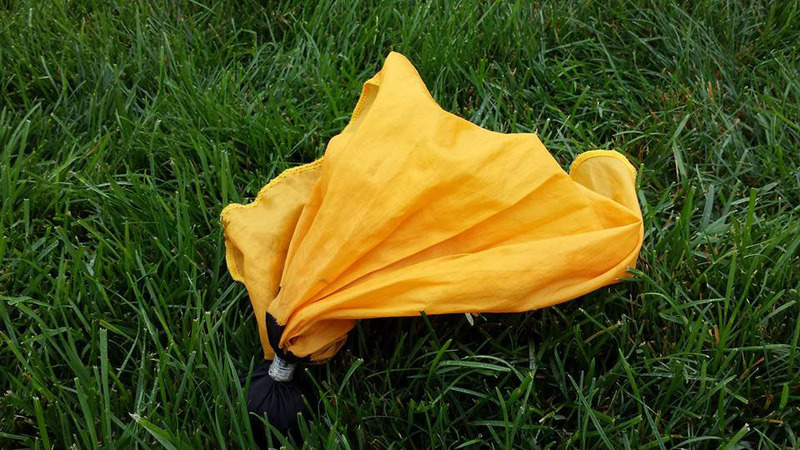 Now, it seems, the governor and state legislative leaders have gone too far, even for him. Here are five things you need to know about the final version of the tax bill now scheduled for a vote in the Iowa Legislature this Saturday: (1) It is not income tax reform, (2) It is not a middle-class tax cut, (3) It is more skewed to the richest Iowans than previous bills, (4) It is very expensive and will force cuts in education, public safety and other services, and (5) It is more likely to hurt the Iowa economy than to help it. 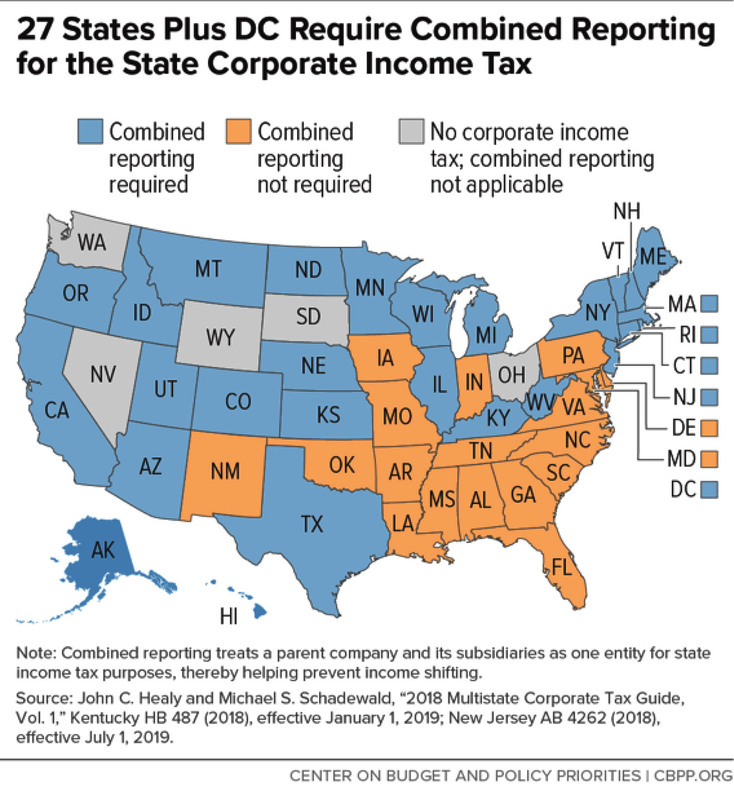 As we have pointed out previously, real income tax reform would rein in expensive business tax credits that have little effectiveness, eliminate federal deductibility, increase recognition of the costs of raising a family, and raise the Iowa standard deduction — which would both simplify taxes for thousands of Iowans, and target tax cuts at lower and middle-income taxpayers. The tax bill does none of these things for the next four years. Earlier versions of the House bill would have increased the standard deduction and eliminated federal deductibility, but those provisions were jettisoned in favor of $40 million in corporate tax cuts and more tax preferences for high-income business owners. The bill does little to reform business tax credits, which have doubled in five years. It adds a new and expensive loophole — a deduction for pass-through income from certain businesses. For the next four tax years the bulk of the tax savings go to the most well off. 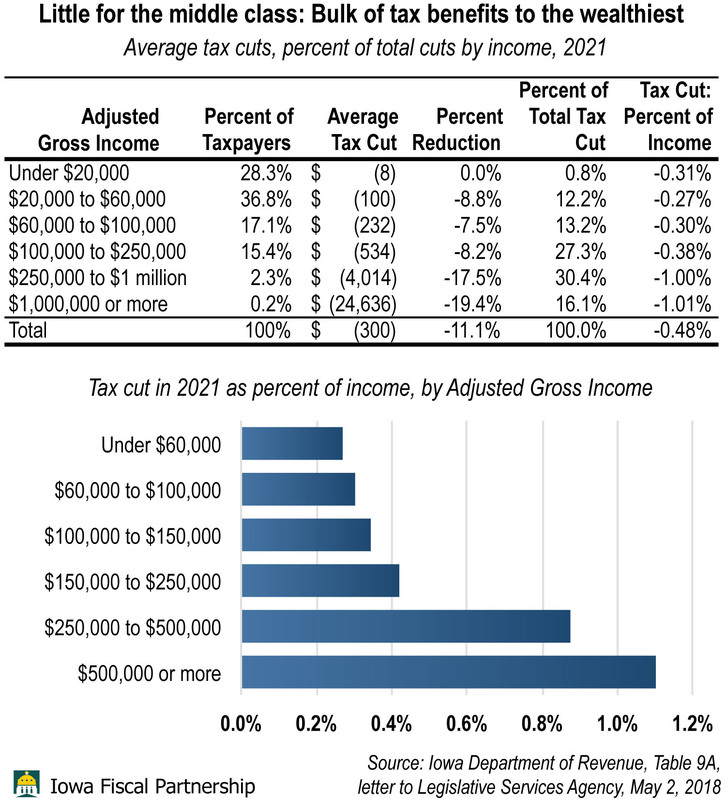 In 2021, almost half of the tax cuts will go to the richest 2.5 percent of Iowa taxpayers, those making $250,000 or more. Their taxes are reduced by 18 percent, over twice the cut for those in the middle. For those making over a million dollars, the tax cut will average $24,636. Meanwhile, those in the middle will see income tax cuts of $100 to $300 over the next four years, much of which will be taken back in increased sales taxes of $35 to $60. All of this comes at a high cost to the state — over $400 million a year by 2021. With over half the budget going to education, this means the underfunding of our public schools and the rising tuition and debt for our community college and university students will continue. The bill’s only “trigger” does nothing to guarantee fiscal sustainability, its purported purpose. The $400 million hit to the general fund will happen no matter how slow the Iowa economy, and state revenues, grow. We could hit a recession in the next two years, and those tax cuts will remain in place. The only trigger governs an additional round of tax cuts for 2023. If the revenue target is met (and it would require growth rates of over 5 percent per year) then the annual cost of the bill jumps to $643 million. Only then would federal deductibility end, and the higher federal standard deduction come into play. If the bill’s backers are counting on growth to come to the rescue, they are willfully ignoring all evidence to the contrary. The last major income tax cuts in Iowa, in 1997-98, not only failed to stimulate growth, but likely contributed to the subsequent slowing of the state’s economy. The tax cuts in Kansas led to slower growth. Former Iowa Department of Revenue official Michael Lipsman discusses tax issues at a public forum last week at the State Capitol as former Senator Charles Bruner, left, and Senators Joe Bolkcom, Janet Petersen and Amanda Ragan listen. The institutional memory of experts such as Lipsman has been lost as legislators have rushed into plans to overhaul Iowa’s tax system, with most discussions taking place outside public view and earshot. Twenty-one years ago the Iowa Legislature enacted an across-the-board 10 percent cut in state income tax rates. That tax cut not only failed to spur economic growth, but bears a share of the blame for the under-performance of the Iowa economy in the years following. And it led to recurring revenue shortfalls and budget cuts. Some in the Iowa Senate aim to repeat the experiment, this time with an 8 percent cut. There is no reason to expect a different result. 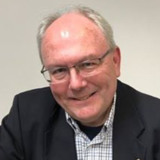 A 2004 report by Michael Lipsman, then head of the Tax Research and Program Analysis Section of the Iowa Department of Revenue, explains why the tax cuts of 1997 and 1998 had a negative effect on the economy. That legislation cut all income tax rates by 10 percent, expanded the exemption for capital gains income, increased the pension exclusion, and exempted lineal ascendants and descendants from the state inheritance tax. The tax cuts were expected to reduce state revenue by $318 million in 2019. But Lipsman estimates that the effect of all these tax provisions was a reduction in revenue exceeding $600 million a year by 2002. Why the larger number? Because not only did the state take a smaller share of Iowans’ income in taxes, but income grew more slowly than it would have without the tax cuts. This runs counter to the ideology of supply-side economics, which predicts that tax cuts will always spur growth. But Lipsman’s point is that it depends on the nature of those cuts — how much goes to non-residents, how much to high-income residents, where savings are likely to be invested, and where goods are produced. 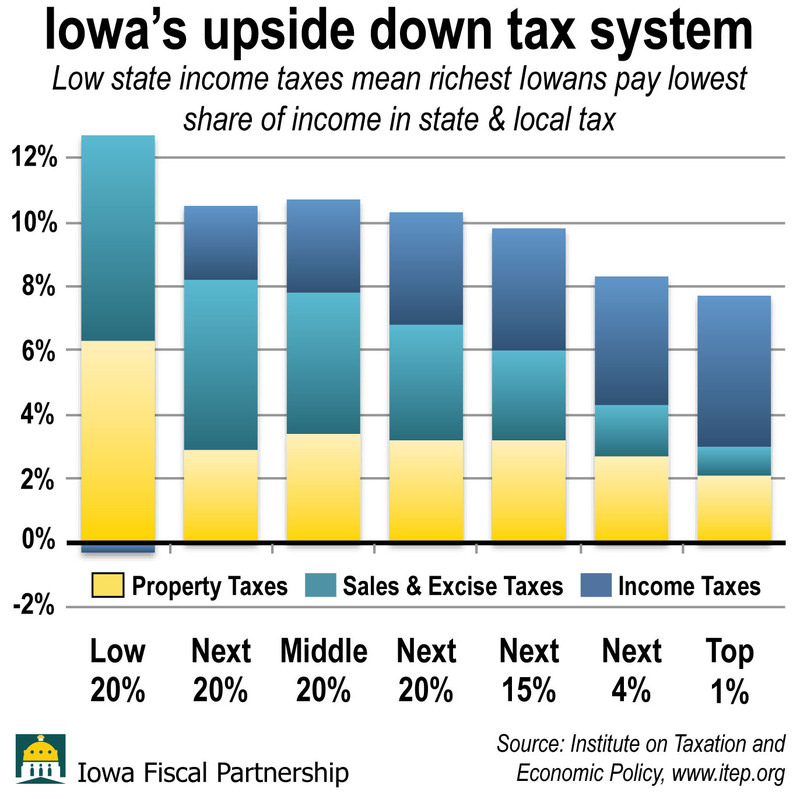 The Iowa tax rate cuts, the pension exclusion, and the capital gains preference all concentrated their benefits on higher income taxpayers, and over a third of the inheritance tax benefit went to non-residents. 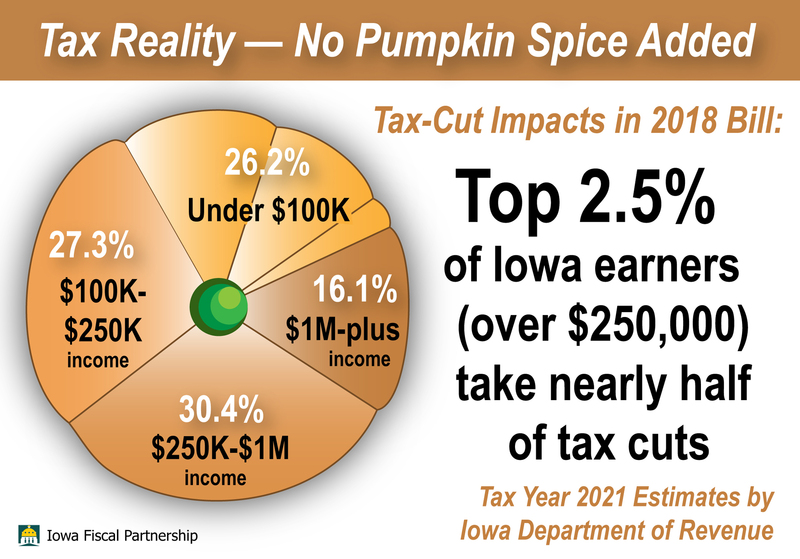 The 3 percent of Iowa taxpayers with over $100,000 income got 24 percent of the benefit from the rate cuts, and these are the taxpayers most likely to invest their tax cut rather than spend it locally. It is likely that much of the tax savings was invested outside the state. Furthermore, most of the high-value consumer goods purchased by upper-income Iowans are produced outside the state. At the same time, the tax cuts reduced state and local revenue, and public-sector employment dropped as a result. State and local government payrolls in Iowa decreased 16 percent from 1997 to 2002, over twice the rate of decline for the country as a whole. And state and local governments spend primarily within the state of Iowa, helping to boost the state economy. Cuts in public sector spending hurt the state economy directly (reduced purchases from local suppliers) and indirectly (reduced local purchases by public sector workers). The upshot is that the tax cuts appear to have slowed growth, taking money out of the economy that ultimately ended up invested elsewhere, or went directly to non-residents, or was spent on goods produced elsewhere, instead of supporting Iowa businesses. In the five years leading up to the tax cuts, the Iowa economy grew at a rate nearly identical to the national economy: 28 percent. In the five years following the cuts, Iowa’s growth fell to 22 percent, compared to the national rate of 27 percent. The massive tax cutting experiment in Kansas produced similar results — the Kansas economy slowed rather than accelerated. The experiment was a failure, and was ended by the Legislature. The latest House tax bill would shower three-fifths of its benefits on taxpayers with income over $100,000, much more skewed to the top than the 1997 legislation. The Senate bill is likely to be skewed as well; it includes a pass-through income loophole that would cost $100 million, four-fifths of that going to the richest 5 percent of taxpayers. Doing the same thing and expecting a different result is not the definition of rational policy making. Michael A. Lipsman. The Economic Effects of 1997 and 1998 Iowa Tax Law Changes. Tax Research and Program Analysis Section, Iowa Department of Revenue, July 2004. These are the major provisions, accounting for 90 percent of the cost. The bills also increased the personal credits and the tuition and textbook credit.